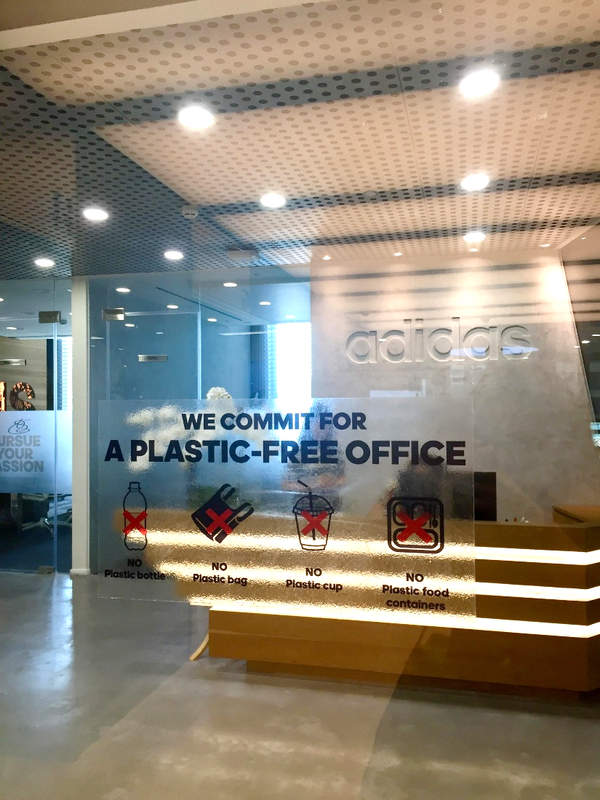 When you enter the adidas office, you cannot miss the sign at the front door “We commit for a plastic-free office”. 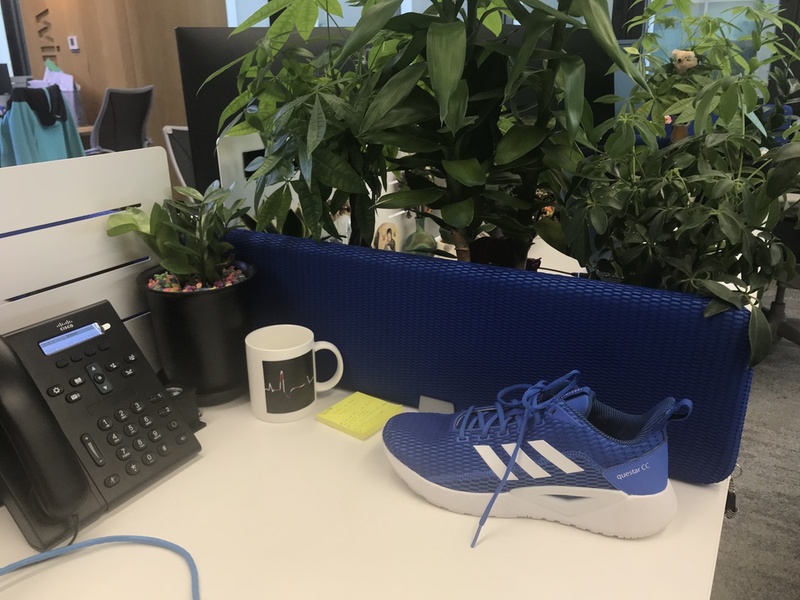 Since they moved their office in October 2017 to the Deutsches Haus, adidas has banned single-used plastic inside their office and has kept up their efforts to raise awareness about sustainability among their staff. The choice of their new location is not insignificant. The Deutsches Haus is the most energy-efficient green premium office building in Vietnam and one of the three building in Asia that is granted -certificates “USGBC LEED Platinum” and “DGNB Gold”, two high certificates that requires certain criteria of sustainability, as minimizing energy consumption for example. For the adidas, to include sustainability in their way of working is viewed as a responsibility for their company to protect the environment. 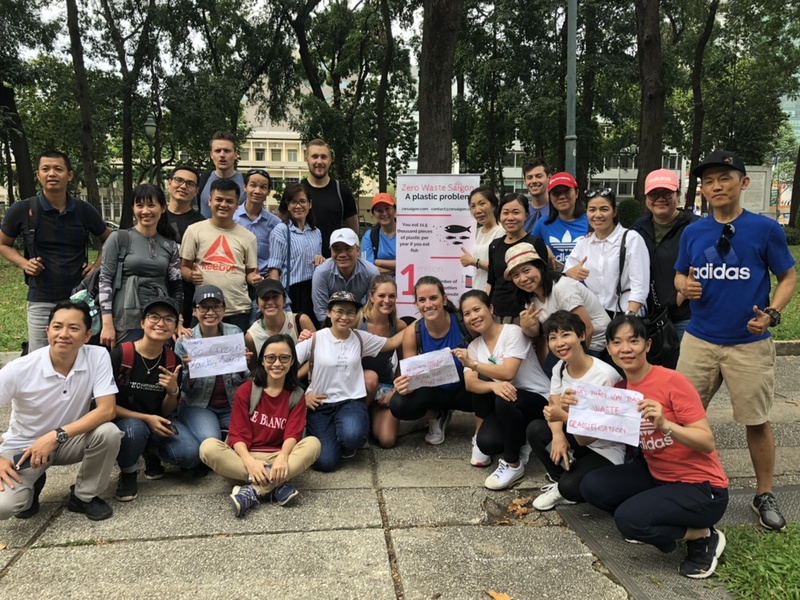 They gave themselves 3 missions: build a sustainability minded culture in their office, driving sustainability awareness for employees and creating sustainability guidelines. In collaboration with Parley, adidas designed and produced millions of pairs of sneakers from plastic waste from the oceans. For a pair of sneakers, they recycle 11 plastic bottles! Furthermore, adidas CEO, Kasper Rorsted, asked to every subsidiary to ban plastic bottles from their office: “Let’s take the next step and abandon plastic from all of our offices globally, I call on colleagues in all locations to come up with solutions. This is not for consultants to figure out, this one is on us. 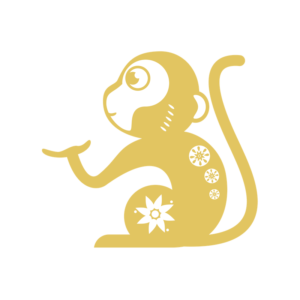 Remember: it is our obligation to do business in a responsible and sustainable way”. 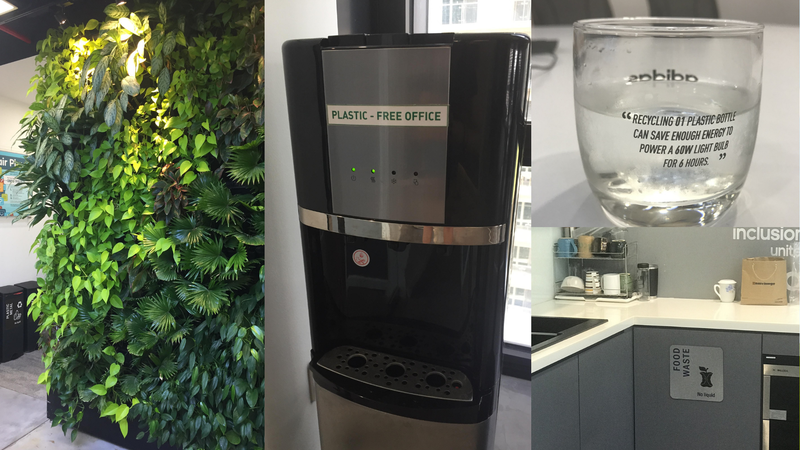 Every office corner and every item used in the office has been rethought to reduce the use of plastic. Glasses were specially designed and printed with a raise awareness sentence and are used by the employees as well as the visitors as mugs. Plastic water fountains were replaced by glass and metal fountains. A green wall of plants brings a touch of freshness and nature in the heart of the office. 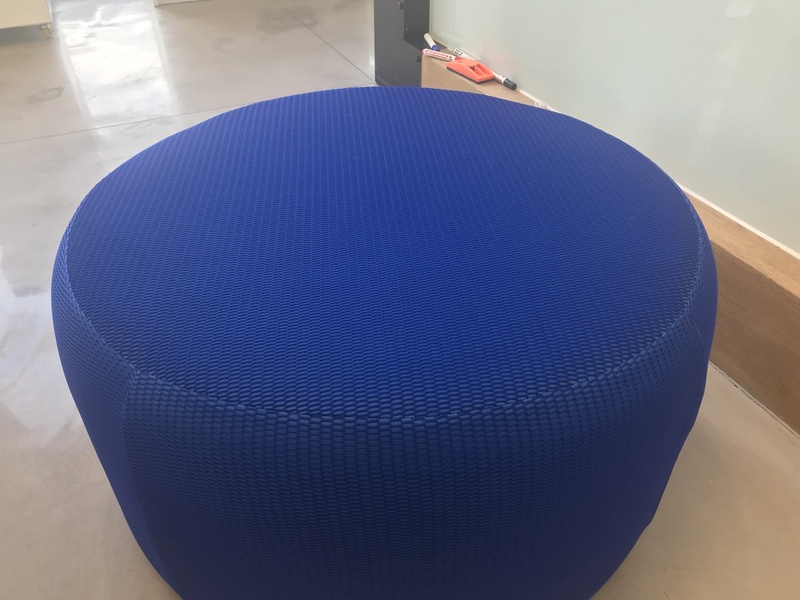 And furthermore, do you see the blue fabric of sofa, stools and work station partition? They are made at the left-over footwear production material. Actions are also organized to directly sensitize the employees. 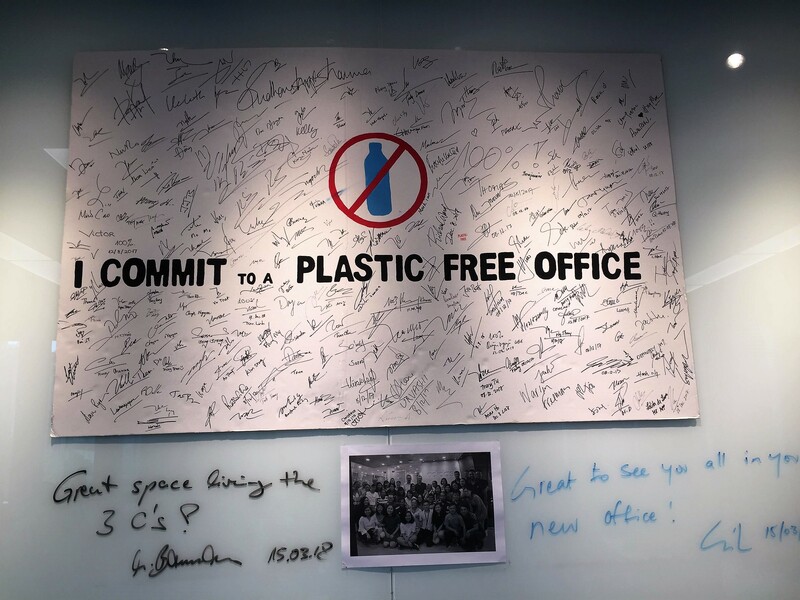 They all together sign their commitment against plastic on a board hung in the center of the office and everyone -receives a glass reusable water container. The office also regulary organized events to enhance sustainability and to raise awareness among their staff. They are a great example to all of us. 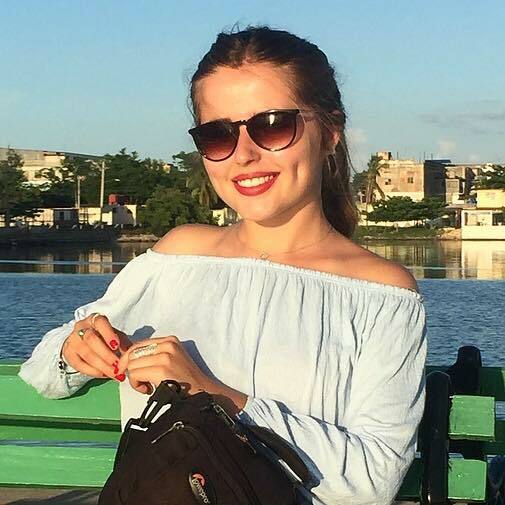 I commit to plastic free office and limit use it at home with whole family to zerowastedSaigon. that is great! Let us know if you would like any suggestions on how to reduce waste at your office.